[ Sir Herbert Beerbohm Tree, actor-manager. ] Autograph Letter Signed ('Herbt. Beerbohm Tree'), thanking 'Mr. Fredericks' for his 'kind remembrance' on a first night. On letterhead of Her Majesty's Theatre [ London ]. 1 May [ no year ]. [Herbert Beerbohm Tree, actor-manager.] Contract for His Majesty's Theatre, London, signed on his behalf by Henry Dana, engaging 'Miss Sylvia Dryhurst' [ the Anglo-Irish poet Sylvia Lynd ] to act in a production of 'The Merchant of Venice'. His Majesty's Theatre [Haymarket, London]. 14 March 1908. Talbot Hotel, Stourbridge, Wednesday 23rd April, 1902. J. T. Ford, Printer, Stourbridge. 12mo: 20 pp. On art paper. Attached with yellow string in decorative printed card wraps. Good: lightly foxed in dusty wraps, with minor staining to blank inside wrap. The wraps, printed in red, blue and gold, feature a photo of Shakespeare's funerary bust within an embossed decorative border. Nicely printed with photos of Shakespeare's birthplace. 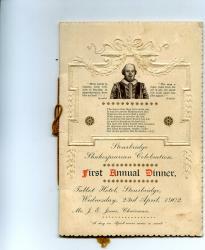 Features the menu, a 'Toast List', a programme of music, lists of committee and patrons and extracts. Of interest are the three pages of letters, including dated communications from Henry Irving, J. The Butterfly. No. 1. March, 1899. London: Grant Richards, 9, Henrietta Street, Covent Garden, W.C., for The Butterfly Press. 1899. 8vo, iv + 38 + [ii] pp. Strangely paginated, the leaves in fact numbering 28. Advertisements front and rear. Bifolium advertisement for the 'World Wide Atlas' tipped in at end. In original printed wraps with strikingly-modern illustration by Edgar Wilson on front, and full-page advertisement for Carl Hentschel & Co, photo-engravers on back, featuring an attractive Arts and Crafts design. Internally clean, but with the leaves loosening, in wraps discoloured with age and chipped at spine (but with the text and illustration clear and entire). Autograph Letter Signed to Lady Monckton. 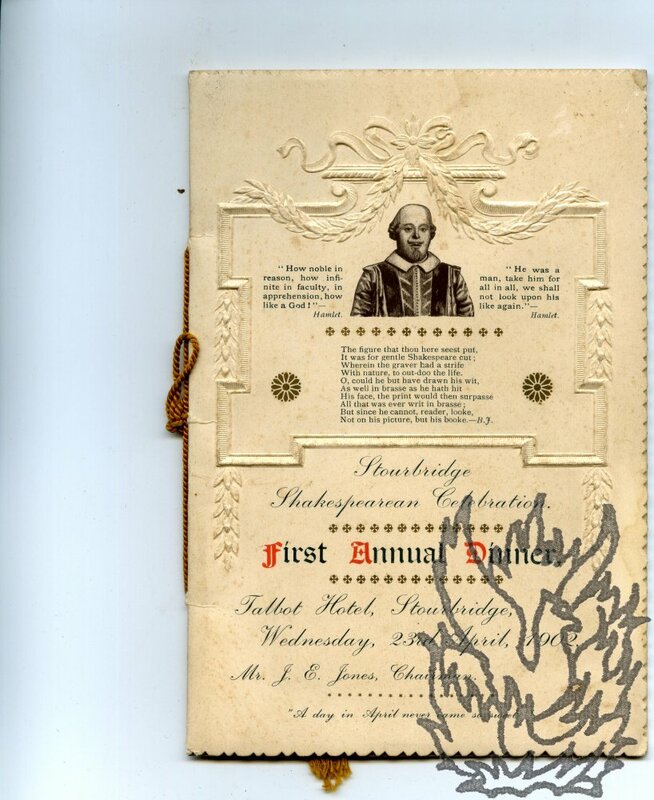 Sunday 11th June 1887'; on Garrick Club letterhead. 25 May [no year], on the letterhead of the Haymarket Theatre. English actor-manager (1853-1917), knighted in 1907. 2 pp, 12mo. "My dear Merivale. / I have induced a friend to vacate his Box for you - Of course I wanted Mrs Merivale to come - I thought you had stalls. / I hope you will think we are behaving well Tomorrow night. / Yours sincerely / Herbert Beerbohm Tree / Kindly return stall ticket". The signature is splendidly sprawling. Traces of adhesive tape, glue and mount to blank reverse of second leaf.